SF State Gators head coach Matt Barnes’ son Monroe, 18 months, is dressed up as a Gator and runs out towards his dad at the end of the soccer game at Cox Stadium in Sunday, Oct. 19, 2014. The Gators beat the Tritons 2-0. Daniel Porter/Xpress. 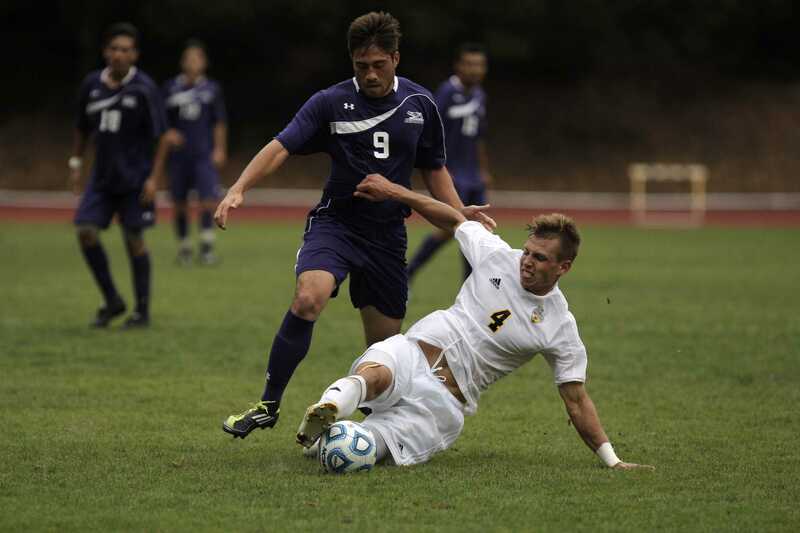 Returning from a five game losing streak, SF State’s men’s soccer team came onto the field hungry for a win, defeating conference rival UC San Diego 2-0. The aggression and energy were manifested through the early first-half attacks, and shirt tugging from the Tritons. However, this didn’t beat down the Gators as the team gained control of the game in the middle of the first-half, but missed six shots on goal. Right when it seemed that the teams would head into the locker room with a scoreless first-half, the Gators came out and attacked. It was in the 38th minute when Gators’ substitute, Matias Rodriguez, made a quick cross to Kevin Johnson who scored a soaring shot into the Triton’s net, giving the Gators a 1-0 lead going into half-time. SF State Gator Jakob Velega, #9 freshman, fights for possession of the ball from UC San Diego Triton Kuba Waligorski, #4, during the soccer game at Cox Stadium Sunday, Oct. 19, 2014. The Gators beat the Tritons 2-0. Daniel Porter/Xpress. As the second-half rolled through, the Gators’ energy continued to stay high. In the 55th minute, the Tritons committed a minor foul that led to the Gators’ forward Sam Merritt’s free kick. Merritt’s free kick outside the box flew straight into the upper right side of the Triton’s net, giving the Gators a 2-0 lead. The tempo of the game changed after the Gators’ second goal. The Tritons began to attack the Gators’ net aggressively with four missed shots in the second-half. Gators’ goalkeeper Daniel Boyer saved three out of the four shots made by the Tritons while the Gators defense created a defensive wall stopping the Triton’s attacks. Pulling an important win after a harsh five game losing streak, was huge for a Gator squad looking to keep its playoff hopes alive. Barnes said, there’s always room for improvement, but it was getting out of this losing stump that proved the team was not going to give up on their season. “Losing streaks are tough. When you’re playing well enough to win every game and you lose in double overtime twice combined with other tough loses, it feels really good to come out and get a win,” he said. The Gators will return to action on Oct. 22 when they face off against off-league team University of Hawaii at HILO. SF State Gators and UC San Diego Tritons line up for the national anthem at the start of the soccer game at Cox Stadium Sunday, Oct. 19, 2014. The Gators beat the Tritons 2-0. Daniel Porter/Xpress.